From competitive gamers and serious writers to airport check-in staff and IT software engineers, heavy duty computerkeyboards with excellent mechanical touch are a must! Keyed Up Labs, a producer of third party computer keyboards based in Irvine, California, already had the solutions to these mechanical requirements, but was looking for something more: how to get great aesthetics, with a durable laser mark print on the key caps. The team at Keyed Up Labs searched for a material supplier who could provide the solutions to their needs, and called RTP Company for a discussion. Keyboard prices range from low cost to expensive, high-end versions sold on the market today. 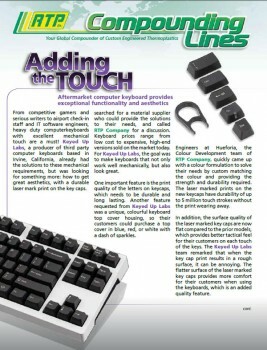 For Keyed Up Labs, the goal was to make keyboards that not only work well mechanically, but also look great. One important feature is the print quality of the letters on keycaps, which needs to be durable and long lasting. Another feature requested from Keyed Up Labs was a unique, colourful keyboard top cover housing, so their customers could purchase a top cover in blue, red, or white with a dash of sparkles. Engineers at Hueforia, the Colour Development team of RTP Company, quickly came up with a colour formulation to solve their needs by custom matching the colour and providing the strength and durability required. The laser marked prints on the new keycaps have durability of up to 5 million touch strokes without the print wearing away. In addition, the surface quality of the laser marked key caps are now flat compared to the prior models, which provides better tactical feel for their customers on each touch of the keys. The Keyed Up Labs team remarked that when the key cap print results in a rough surface, it can be annoying. The flatter surface of the laser marked key caps provides more comfort for their customers when using the keyboards, which is an added quality feature.